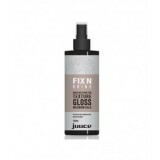 Juuce Full Volume Conditioner thickens fine, limp hair to boost volume, body and shine while stre..
Juuce Full Volume shampoo thickens fine, limp hair to boost volume, body and shine while strength..
Juuce Amp It Up 200ml BODY BOOSTING SPRAY Boosts volume at the roots to increa.. Gloss and Fix Styler Versatile styling and finishing spray to fix and hold. Spray ..